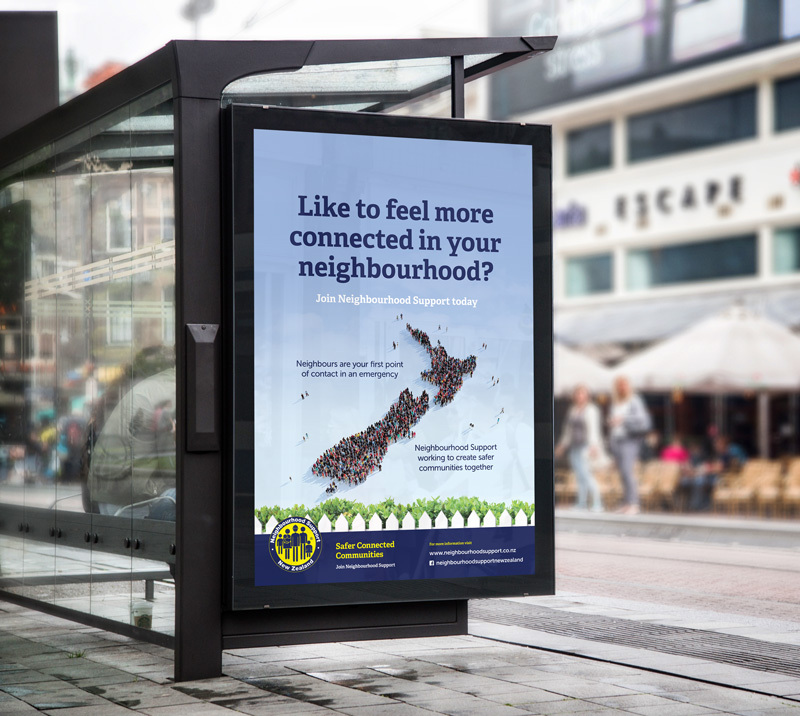 Neighbourhood Support is an organisation working in New Zealand to build communities that are pleasant places to live in, with less crime. It promotes and supports groups of people who share this goal, and works closely with the police and other community organisations. 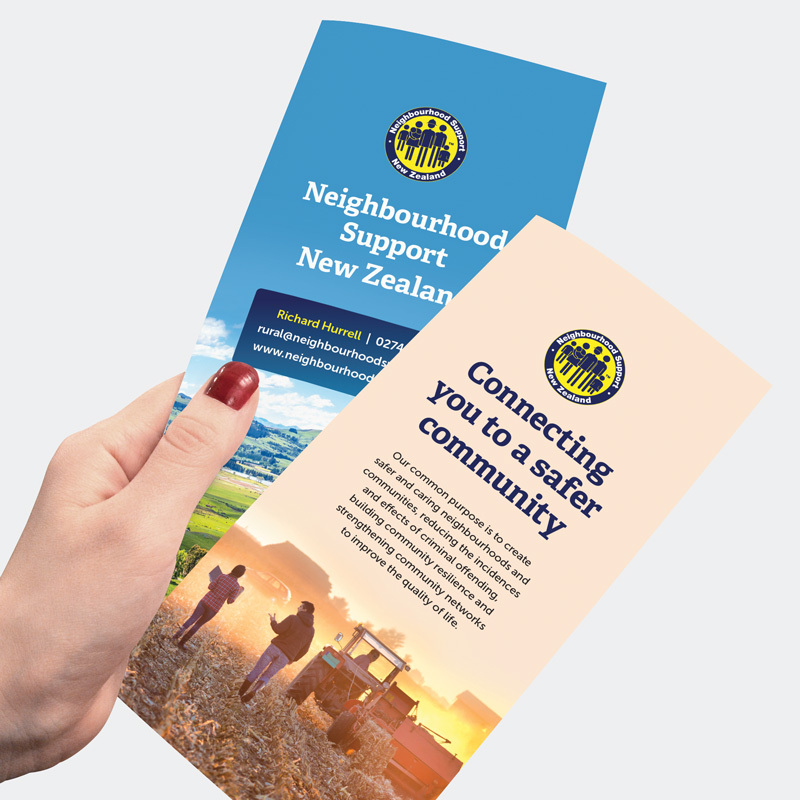 Over the course of many years, Neighbourhood Support’s visual identity – its look and feel – had been weakened by inconsistent application organisation-wide. We came on board to right the ship by developing clear guidance for the use of the brand’s appearance across all mediums, and entities associated with the client’s brand. We subsequently executed collateral based on the reunified visual style. Neighbourhood Support were concerned that, over time, their brand’s visual identity had become diffused, and less recognisable to their audience due to inconsistent usage of the logo and visual elements across their network. Therefore, they were looking for help to develop guidelines with usage rules for their employees to follow when producing branded marketing material. 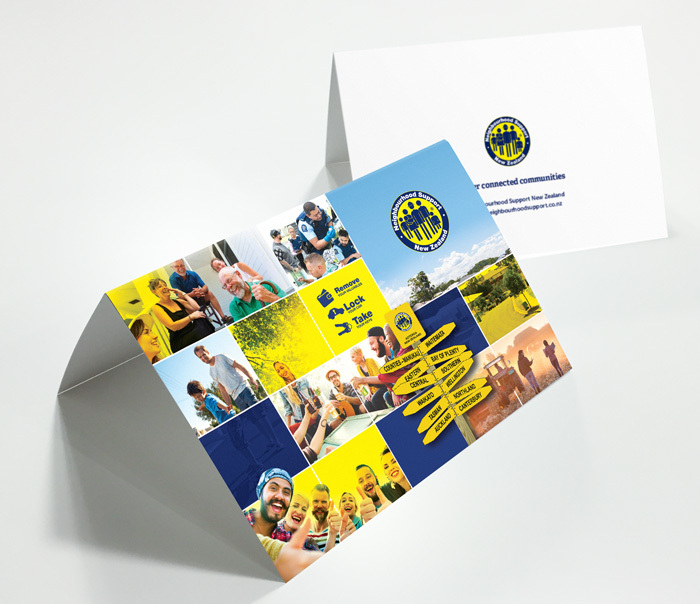 This would ensure a consistent look and feel for their brand. 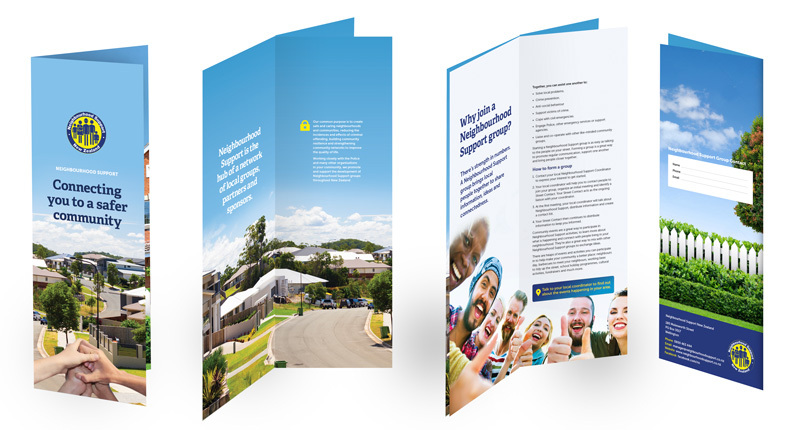 Neighbourhood Support approached us because they recognised our experience guiding and enhancing brand identities, as well as our technical file knowledge, and expertise with colour matching. A substantial amount of the client’s print output was being done in-house on office printers, and we needed to factor this into the brief. 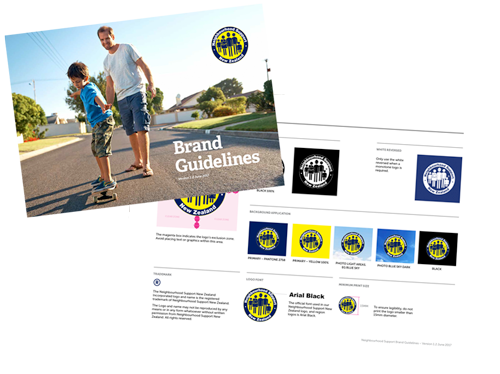 We developed the official brand standards guideline to help our client’s employees understand how they should use their brand assets in their marketing collateral. What was in the brand guidelines? 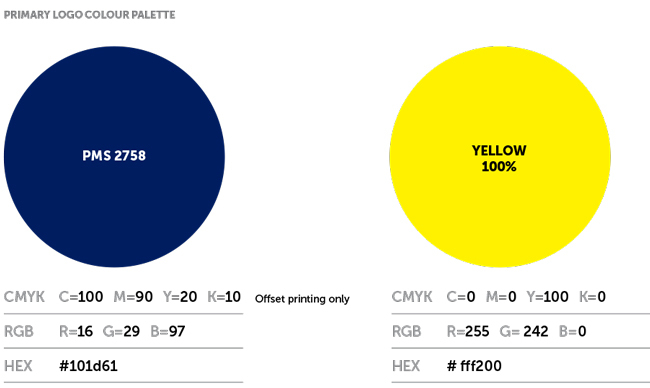 We tested, selected and assigned PANTONE® colours for the client’s primary blue and yellow, which we knew would print beautifully. We then calculated the CMYK and RGB equivalents that could easily be reproduced on a standard office printer. We added the registered symbol ®, and created two-colour PANTONE, CMYK and RGB variants. We also designed a single-colour greyscale version, and reversed versions for coloured background application. We created a logo template that could be applied across all Neighbourhood Support districts nationwide, and executed logo designs for each of the 60 groups in the network. Logo usage rules were also developed to communicate the importance of not editing or changing the logo. We selected two complementary font families for use in professional design software and Microsoft Office programmes. The fonts were selected to modernise the brand and improve text legibility. Typography styles were developed in the course of designing brochures and booklets for the client. The old saying, “a picture paints a thousand words” applies to every brand. We developed a set of parameters for selecting consistent stock imagery. The brand imagery needed to evoke a “friendly, safe and secure, strength in numbers, community” feeling. It achieves this by showing groups of people of all ethnicities and age groups, in a positive mood, and with vibrant colours. With guidelines for the brand in place, Neighbourhood Support employees are clear about the usage rules for the logo and other visual assets such as fonts and imagery, when developing marketing materials across web, print, and social media. 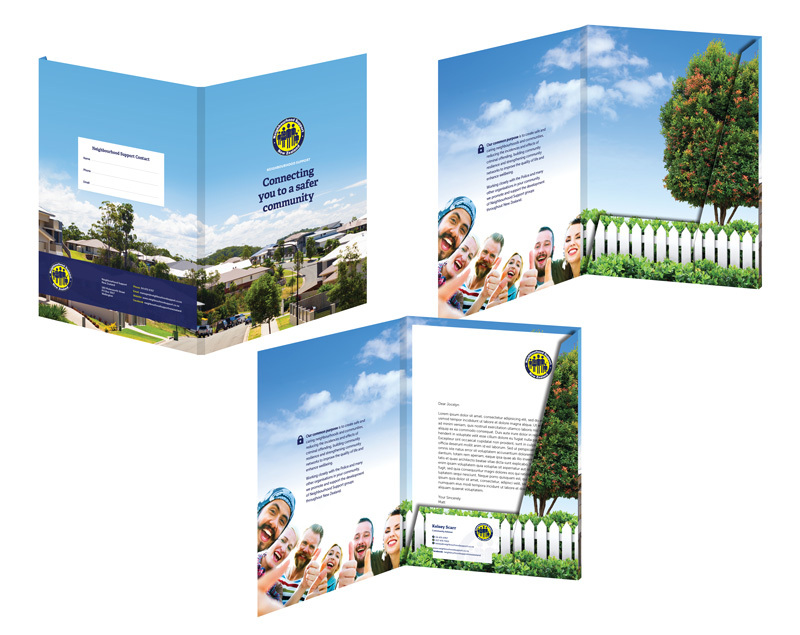 As a result, there is increased efficiency when staff deal with external design and print suppliers, and renewed confidence in the brand itself. With guidelines for the brand in place, Neighbourhood Support employees are clear about the usage rules for the logo and other visual assets when developing marketing materials.